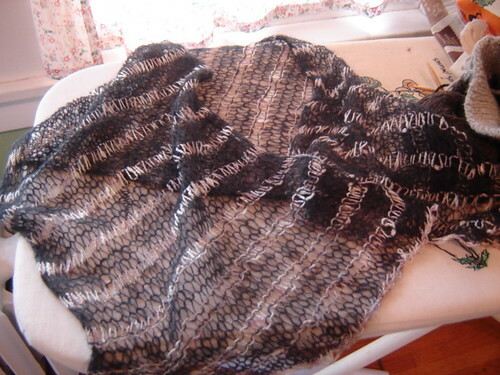 It’s the Mason-Dixon Scribble Scarf, and I have to say it’s a nice quick knit, especially when you want something cute to go with the plain old black maternity dress you just had to buy. Sorry for the lack of real life modeling shots. It did look cute with the dress. As you can see, it’s shorter than a scarf, I guess it’s more of a stole. I just kept knitting on the drive down and cast off when we got to the hotel. 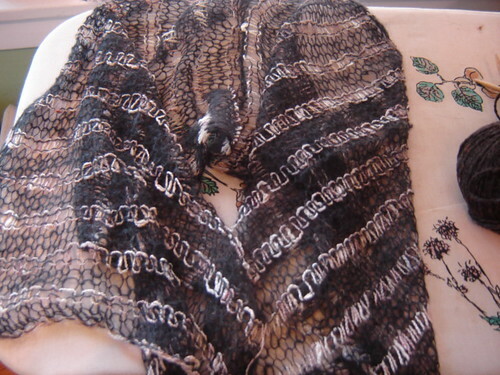 The yarn is Crystal Palace laceweight mohair and some sort of rayon novelty yarn from Knit One Crochet Two. As usual, the labels are lost. I’ll be back with more soakers in a couple of days. I also purchased a diaper pattern, so we’ll see what I manage to sew up. To be honest, I’m amazed I can manage to read and understand a pattern these days. I can’t believe what major baby brain I have this time. The other day I actually melted our camera. Lucky for me it still works, especially after all that work the Skeptic put into fixing it the last time I broke it. Little Man had swiped it, and I took it and hid it in what brilliant place? The top of our toaster over. Then I heated up some rolls in it for ten minutes. Yeah, I’m totally on top of things!